Decoding the “leading question” objection. Mock trial competitors often struggle with the concept of the leading question. Lawyers also struggle with this. Everyone has heard of the courtroom objection, but it is difficult to define when a question is “leading” and when it is not. It is often said by lawyers that a leading question is a “question that suggests an answer”. But legal texts define it as follows: A leading question is one which, either through form or substance of the interrogation, instructs a witness, or puts words in the witness’s mouth to be echoed back, or one which suggests to a witness the answer desired. (See Glen Weissenberger, Federal Evidence 1996 Courtroom Manual 134 (1995); Black’s Law Dictionary 888-89 (6th ed. 1991).] Generally, each judge has his or her own limit on how much an attorney is allowed to “lead” a witness. Courts have ruled that “the allowance of a leading question is within the discretion of the court, and is no ground for reversal.” See Farmers’ Co. v. Groff, 87 Penn. St. 124. The problem for lawyers, is where do you draw the line? For example, let’s say a prosecutor is interviewing a witness who observed an armed man who was fleeing the scene of a bank robbery. A prosecutor may ask: “Did you see Mr. Smith fleeing the scene with a gun?” That would be leading. But what about the questions “Did you see Mr. Smith fleeing the scene?” or “Was Mr. Smith fleeing the scene?”? The problem is that most judges would also likely find even those questions to be leading. A lawyer is usually left with simply asking the witness if he observed “anyone fleeing the scene”. The problem with this is that the witness is likely to then decribe any number of people fleeing the scene, such as bank tellers or account holders. A lawyer would then meekly ask “uhm, anyone else?” and simply hope that the witness gets the idea. You can kind of see now why some trials take weeks and weeks to get through testimony. On the subject of the defendant fleeing with a gun, a lawyer would typically ask: “Was there anything in Mr. Smith’s hand?” or “was he carrying anything of note?” Those questions seem simple enough, but often times a nervous witness will “choke” and find the phrase “anything of note” to be confusing. This is particularly true if the witness mistakenly assumes that lawyers will ask fairly straight forward questions. What a good trial lawyer does is to craft questions that are just leading enough without raising an objection. This takes practice. In the context of a mock trial competition, your classmate witnesses will generally know where you are trying to go with a question. And unlike a real trial, it is not wrong or unethical to “prep” a witness for a mock trial competition. Student attorneys score points by how well they can ask non-leading questions, and they also score points by making timely objections to improper questions. 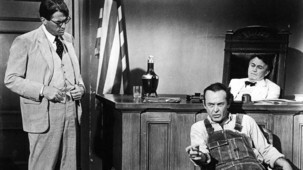 See my earlier post: Preparing for that Big Mock Trial Cross-Examination, Part I. There are a few exceptions when a lawyer is allowed to ask a leading question. First, on cross examination, a lawyer may always ask leading questions. (That is, when you are questioning witnesses from the team of the opposing school. Second, a lawyer is sometimes allowed to ask leading questions of an expert witness. Third, a lawyer may ask the judge to declare a witness “hostile” and ask him or her leading questions. I have never seen this last category work in real life however. Let’s face it, it is not pleasant to be cross-examined. The witness is at a disadvantage. The lawyer has the element of surprise. He or she knows in advance what they are going to ask. The witness does not. Here are some tips to help you get through a mock trial cross-examine. 1. Know your witness statement inside and out. Also it is also helpful to read the other witness statements. You cannot answer based on what other witnesses have experienced, but it may help you anticipate what the cross-examiner will ask. In real life this would be impermissible witness prep, but is not prohibited in mock trial. 2. Remember what “overruled” and “sustain” mean. If an objection is made to the question, you may answer the question if the judge “overrules” the objection. If the judge “sustains” the question, you may not attempt to answer, and you have to wait for the next question to be asked. 3. When prepping for your mock trial, make sure you get a commitment from your lawyer teammate to protect you on the stand. If the cross-examiner is badgering you, or asking improper questions, you cannot object. Rather your teammate lawyer must object. The natural tendency is for mock trial student lawyers to relax after they have completed their direct examination. This is not good. They need to keep on their toes to protect you during cross examination. I like to use the analogy of a player needing a block or a screen during sports. 4. Remember the answers “I don’t know”, “I don’t recall”, and “I can’t answer that”. To buy time so you can think, you can always ask the attorney to repeat the question. If all else fails, ask if you can ask for a glass of water. And I am only half kidding about that. 5. Prepare to testify by sitting in the witness chair. Sitting in the witness chair can cause a little stage fright for the first time. “Test drive” the chair before trial, to get the cushion right, the microphone right, and to see how it feels. 6. Stay in character. 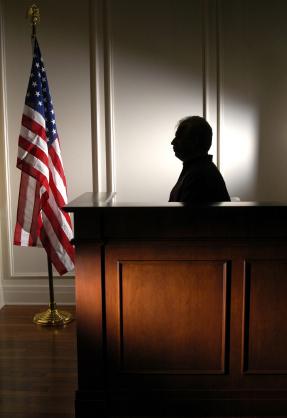 Unlike real life, the mock trial scenario only provides limited information. If the questioner, asks you “what color was the get away car?” you can’t answer if that wasn’t in the classroom material. “I don’t recall” is a better answer than saying that it wasn’t in the class material. Ultimately, you will score point for your team by knowing the material, and by remaining patient with the questioner, and not getting flustered. If the lawyer is needlessly rude or sarcastic during the cross examination, you score points simply by not responding in turn.